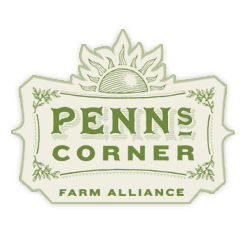 Penn's Corner is pleased to offer hog shares from Blackberry Meadows! The hogs are raised in open air on the farm from birth and are not confined to an indoor space. They root for insects and roots, while eating much of the foliage from the above ground plants and bark. They are also fed culled organic vegetables from the farm, and supplemented with a non-GMO verified feed. Now accepting orders for the current round! Sign up for a hog share here! Hog shares will be split into three deliveries, and will be delivered to your pick up location on August 28/29, October 16/17, and November 13/14. The cost for a hog share is $330. Sign up here for your Pork Share! Check out the Ethical Farming Fund's Virtual Farm Tour of Blackberry Meadows! Click Here to read some helpful FAQs about your hog share. Here is a helpful article about pork cuts, including what part of the pig they come from, and how to cook them!